Infuse your home with the iconic, natural scent of lavender, and benefit from the stress-relieving fragrance of this timeless botanical. Our Lavender Diffuser is made using 100% natural ingredients and extracts, delivering pure, long-lasting floral scent throughout your home. Renowned for its stress-relieving properties, natural lavender extract is a beloved home fragrance used for centuries to relieve stress and anxiety, and help people overcome sleeplessness and insomnia. This pretty lilac-coloured flowering shrub produces one of the world’s favourite scents, and our 100% natural luxury fragrance diffuser means you can enjoy the pure, irresistible scent of lavender in your home like never before. Each of our luxury lavender fragrance diffusers features 100ml of natural fragrance oil, comprised of ethically-sourced lavender extract that will evaporate more slowly than other diffusers. To infuse your space with the pleasing scent of lavender, each diffuser is supplied with a handful of natural rattan sticks, which work to deliver even and consistent fragrance in any space, so you can enjoy pure and long-lasting fragrance for the lifespan of the diffuser oil. Capturing the wonderful fragrance of lavender in all its stress-relieving beauty, our Lavender Diffuser is the ideal choice for those wishing to infuse their home with relaxing and soothing fragrance. 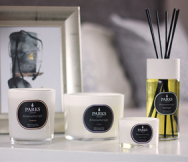 Whether you choose to keep the diffuser in your bedroom, lounge or bathroom, the invigorating and soothing scent of lavender promises to be a welcoming addition to your living space. Packaged in a charming box and offering up to 8 weeks of quality fragrance, this luxury perfume diffuser makes the perfect gift or a special treat just for you.